Hyundai has launched their highly anticipated small family car, the 2018 Santro, on 23rd October. Check out all the detailshere. Powering the new Santro 2018 is a 1.1-litre, four-cylinder engine that makes 68PS/99Nm (petrol) and 58PS/84Nm (CNG) respectively. The petrol version will be available with a 5-speed AMT over and above the standard 5-speed manual gearbox. As expect Hyundai has agressively priced the Santro 2018 with prices starting at Rs 3.89 lakh, and topping out at Rs 5.65 lakh (ex-showroom,Delhi). 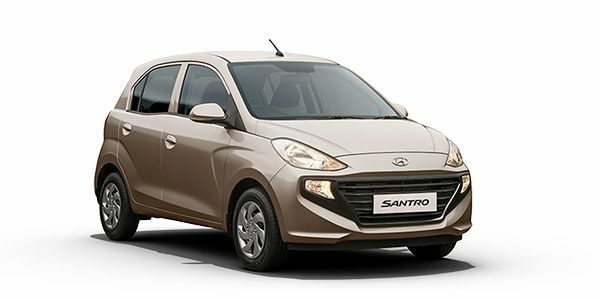 Hyundai Santro prices start at Rs. 3.90 lakh for petrol and goes upto Rs. 5.47 lakh. Hyundai Santro is available in 9 variants and 7 colours. The claimed ARAI mileage for the Hyundai Santro petrol is 20 kmpl, and for the Hyundai Santro cng is 30 km/kg. Q. Is it comfortable with 5 seats and two kids? I hope you are four or five members in your family, and this will be pity comfortable for you, no doubt about it. Q. We already have a Car (Ciaz) at home, my dad uses for commute and family trips; looking for small car for my commute to Office and weekend highway runs. (1250km) every month. I'll be the only person using it. Max budget 5 lakhs, prefer good safety features. Maruti/Hyundai only. Q. Does Alto k10 VXI has less fuel efficiency than Santro Sportz? Compact, roomy, easy-to-drive. These three traits are as true for the current Santro as the original one we saw two decades back. Yes, Hyundai has cut a few corners, but it’s one of the most non-fussy cars you can get today. It looks like an i10! We’re sure that’s the first thought that pops into your head if you look at it. We see it too. But upon close inspection, you’ll see that every single panel on the hatchback is completely new. It looks unmistakably Hyundai with that gaping grille. How we wish Hyundai offered some bling at this price point by the way of daytime running lamps or alloy wheels. The plain-jane design is somewhat uplifted by the prominent character lines on the side profile and that quirky kink in the window line. But here’s the deal. That kink actually serves a purpose, it’s meant to provide rear occupants that much more glass area and in effect, make the cabin look larger than it is. And since the Santro continues to be a tallboy, you wouldn’t be left wanting for more headroom either. But it’s a four-seater in our books. Five is possible, but not recommend. Move to the front seat and you’d like the room on offer. We do have complaints, though. The headrests are fixed, the driver seat can’t be adjusted for height and the steering wheel is fixed too. Tall drivers will take some time getting used to the slightly awkward driving position. In terms of features, the top-spec Santro is well-equipped. You get a 7-inch touchscreen infotainment system (with Android Auto and Apple CarPlay), rear AC vents, steering-mounted audio controls and all four power windows. Safety tech on the top-end variant includes dual airbags, and ABS with EBD. Sadly, the front passenger airbag is not offered as standard and is limited to the top-spec Asta variant only. Absolutely not done, Hyundai! With the Santro, Hyundai’s old workhorse - the 1.1-litre Epsilon engine - has made a comeback. This 4-cylinder engine is known to be reliable, refined and efficient. In petrol variants, it makes 69PS of power and 101Nm of torque. A factory-fit CNG kit is available as well, where the engine makes 59PS of power and 86Nm of torque. Pick the petrol and you get to choose between a 5-speed manual and a 5-speed AMT. However, the CNG is offered with a 5-speed manual only. In our road test, the petrol-manual was happy to be frugal, returning 14.25kmpl in the city and 19.44kmpl on the highway. The AMT was no less efficient as it returned a similar 19.42kmpl on the highway, but took a tiny hit in efficiency inside the city with a figure of 13.78kmpl. It's easy-to-drive nature shines through, and the Santro makes for a good city companion. The Hyundai Santro variant list includes the D-Lite, Era, Magna, Sportz and Asta. We wouldn’t recommend any variant that does not have a minimum of two airbags, so our default choice here is the Asta. But, let’s take a quick tour of the other variants anyway. Starting with the Santro D-Lite, this variant is quite barebones. It doesn’t even feature power windows or air-conditioning. For this money, you can look at better specced vehicles such as the Datsun GO. Move up to the Era and things are no different. You get an air-con and front power windows, but the rest of the package is the same. Skip. It’s from the Magna variant onwards that the Santro actually feels like a hatchback launched in 2018. There’s chrome on the front grille, body coloured ORVMs, a 2-DIN audio system with Bluetooth. This is also the base variant if you’re buying the AMT or the CNG version. In the one below top Sportz variant, there are more goodies in the form of a touchscreen music system, steering-mounted audio controls, bigger 14-inch tyres, rear defogger and electrically-adjustable mirrors. If this had dual airbags, it’d be the variant we’d recommend. In the top-spec Asta variant, you additionally get a reverse parking camera, front fog lamps and a rear wash/wipe. Did we mention this is the only variant you get dual airbags in? Why Hyundai, why! Maruti WagonR: Maruti’s tallboy is as practical as little hatches get. While it doesn’t have a diesel engine to offer, the petrol engine is known to be peppy, refined and economical. Maruti Celerio: Although the Celerio was the first car to introduce Indians to the concept of affordable automatic cars, it has not been able to attract enough customers thanks to tough competition from better looking and better-equipped cars priced lower and higher than it. It is not a bad car per se, but the multitude of options in the market don't help it stand out. Tata Tiago: The Tiago marks a new age for Tata Motors. It does almost everything right - it’s well-built, has a roomy cabin, an adequately sized boot and is packed with features. The everyday engines are boring to drive, but you can always get the JTP for the giggles! Nissan Micra Active: Among the most successful models globally, the Micra brings a polished recipe to India. Compact proportions, zippy engines and just about enough creature comforts to not let you whine. It’s beginning to show its age though. Twenty years on, the core strengths of the Hyundai Santro remain. It’s a smooth, efficient and easy-to-drive city car. The premium features are just a bonus. Now can we please have dual airbags as standard, Hyundai? What has 10 years done to some of the most popular cars on sale in India in 2009? While the 2018 Hyundai Santro is quite an appealing product with a big feature list and smart looks, it does miss out on a few aspects which would have otherwise made it a more compelling choice. Santro is a good car, but as you know that after a time things get old. It is amazing when we buyed it.